In part III of this series (click here to see Part I and Part II), I outlined three major disconnects between traditional worksite health promotion and employee and organizational health. The third and perhaps most important disconnect was the use of extrinsic motivational techniques, which can result in decreased employee engagement. In the final part of this series, I want to explore this issue further. The literature with respect to the use of extrinsic rewards at the workplace is no less daunting. 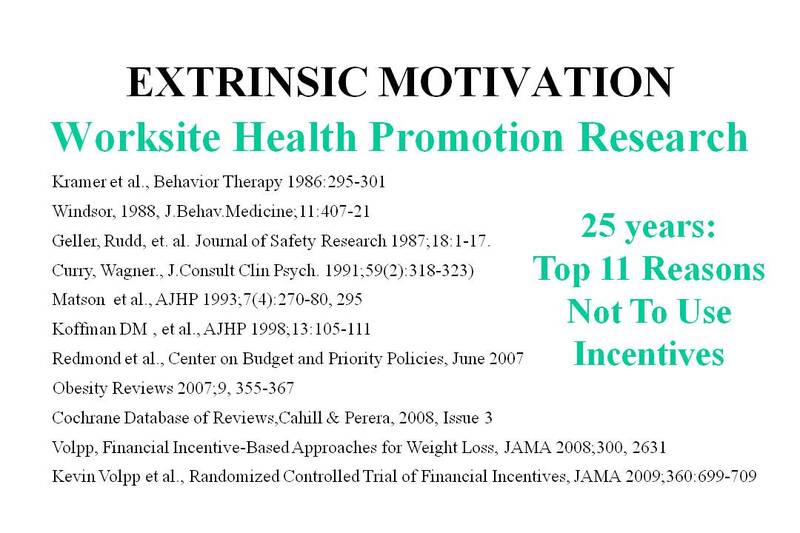 Below are The Top 11 Reasons Not to Use Incentives at the Workplace: 25 years of research all coming to the same conclusion. There are a myriad of proposed explanations for why these approaches do not work, (see Kohn, Punished By Rewards) but thanks to advances in neuroscience technology, we are beginning to get a glimpse of what is actually going on in the brain. The picture above identifies four areas of the brain involved in the story. The prefrontal cortex is the newest part of the brain. The neurons (nerve cells) here are responsible for the creativity and decision making that makes us uniquely human. No other creature has such a well-developed cortex, and this part of the brain probably does not exist at all below the higher primates. When we receive input from the outside world, the working memory of the pre-frontal cortex takes in the new information and matches it to what is already known. It is a very energy-intensive area that fatigues quite easily. The basal ganglia are clusters of neurons that represent a much older area of the brain. Any activity that is practiced repetitively becomes a habit and is stored in the basal ganglia to be called upon whenever it is needed. Once we learn how to ride a bike, we no longer have to think about it because the neural patterns it requires are stored in the basal ganglia and they are called up unconsciously whenever we need them. In fact, thinking is likely to take away from the performance of these stored activity patterns. The baseball pitcher who consciously thinks about the motions he goes through to throw a curve ball will perform poorly, because the stored patterns are too complicated to be thought of consciously. The limbic system is one of the oldest parts of the mammalian brain. It is the seat of emotions. When we are challenged or frightened, the limbic system kicks in, and what results is the body’s preparation to fight or to flee. Finally, the nucleus accumbens is a group of neurons that is often referred to as the pleasure center of the brain. Pleasurable experiences of all kinds stimulate these neurons to release chemicals that make us feel good. 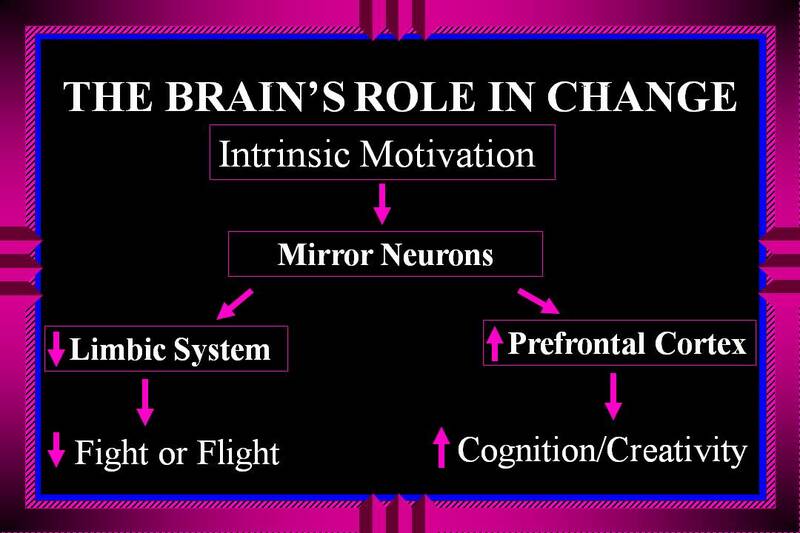 Thanks to the miracles of positron emission tomography (PET) scans and functional magnetic resonance imaging (MRI) we are now able to see what happens in the brain in response to extrinsic and intrinsic motivation. The picture below represents what happens in the brain when people are pushed or prodded to do something they probably would not do otherwise (remember this as the stated purpose of incentives in health promotion). Extrinsic motivation stimulates the basal ganglia because what is being suggested goes against the established patterns stored there. As a result of the error detection that occur, the basal gangliastimulates the limbic system causing fear and anxiety as the body prepares to fight or flee. At the same time, , as shown below, the basal ganglia send inhibitory signals to the pre-frontal cortex, telling it that now is not the time for cognition and creativity. The bottom line is that when people are pushed, prodded and coerced to do something, they respond by shutting down their creative capacities and becoming anxious, fearful and sometimes even combative. When people are intrinsically motivated, however, or in other words when they are immersed in and enjoying what they are doing – just for the doing, the story (below) is quite different. Specialized cells called mirror neurons actually minimize input to the limbic system and stimulate the pre-frontal cortex. Here the bottom line is that cognition, creativity and productivity are maximized. So, what does this all mean for worksite health promotion? Based on the four parts of this blog, the bullets below suggest a vastly different approach from the traditional. Re-conceptualize health as a dynamic dance between the inevitable frailties and imperfections of being human and the desire for well-being and happiness, rather than a never-ending quest for reaching some “optimal” holy grail of biomedical, physical and behavioral perfection. Accept that the foundation of a “healthy work culture” begins with and ultimately rests on the quality of the relationships among its people rather than on what they eat, how much they exercise and whether or not they practice stress management techniques. Fully embrace Shared Responsibility: If organizations want employees to feel valued, then they have to really value them. Exercise, nutrition, and stress management can have only limited impact on the bottom line in a dysfunctional environment. Fully embrace Authentic Intention: If economics are the prime reason for worksite health promotion interventions then employees will know it, the programs will show it and they will ultimately fail.